Hey friends, Want some Eco-Friendly Products to green your life? Luckily, there are SO many ways that you can help make the planet a cleaner, greener place. Today I wanted to share my current Favorite Top 10 eco-friendly products. super easy to use, easy to find online or in your town, sometimes used!, and all under $25! And that all help reduce plastic and other pollution. Win, win, win, win! These eco-friendly products are super easy swaps for polluting plastic and paper waste! Just imagine, If we all used these, there would be so much less plastic pollution in the world. We could save TONS of plastic and paper from landfills, beaches, rivers, and oceans! I don’t know if this happens to you, too, but EVERYTIME I see a sea creature that’s been harmed or killed by plastic pollution, I feel just awful. AND it helps me re-energize and recommit to avoiding plastic wherever I can! Did you know that even paper products create greenhouse gases if they aren’t disposed of properly? Even though they are biodegradable, they won’t biodegrade well in a landfill. So, here are my top 10 super affordable and eco-friendly products to make the world a greener place. Plus, some of my tips on incorporating these into your life! These are awesome. You can find some that are 100% compostable, and that will easily breakdown in your own home compost (or city compost, if you are one of the lucky few to have this option!). I love them. My toothbrush tip for you – if you (and any kids of yours) visit the dentist regularly, they’ll probably try to give you a plastic toothbrush. Be prepared! Let them know that you don’t need the freebie plastic toothbrush that they have for you, and tell them you use a bamboo toothbrush. You might even encourage them to start handing out bamboo brushes too! Eco-friendly dentist? Yes, please! I actually have a few of these right now and they are AWESOME. I use mine EVERY. SINGLE. DAY and haven’t used a disposable coffee cup for probably a couple years now. And there are SO many awesome options out there. I love them all. You can probably even find some at your local thrift store! My kids and I use a travel mug for hot chocolate from the coffee shop too – they are ready for their own! Luckily I have enough to share with them for now. In a pinch, we just bring a regular mug from home. Lots of coffee shops will give you a discount, too, for bringing your own mug! Yay for discounts! Single use plastic bags are the worst. They aren’t always recyclable, they can be super polluting, and they may even leech toxins into food. Yuck. 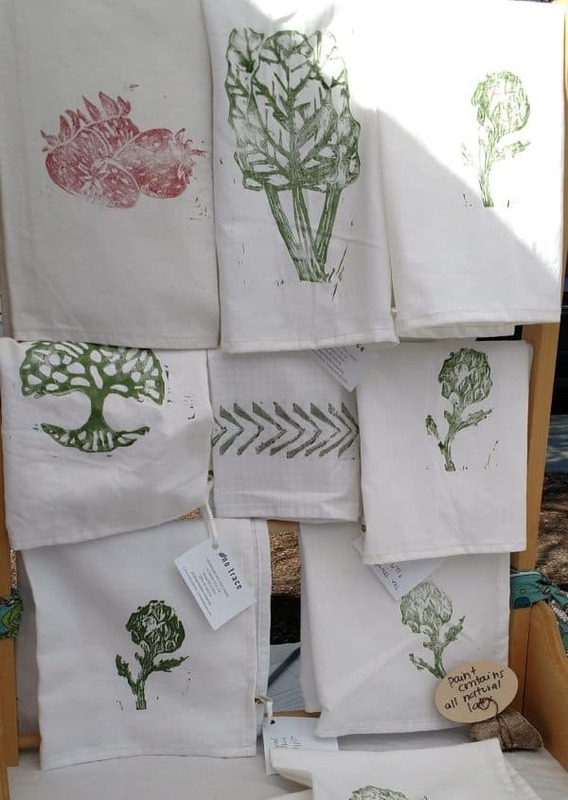 Introducing: reusable veggie bags! Now, I’m not ashamed to promote my own here – made with upcycled cotton, even! BUT there are lots of options on the market, and these are the types of things you can even sew on your own with very few sewing skills! So, get the ones that work for you, but get some! I use mine to shop with AND I even store my greens and other veggies in them. Side note tip for you: there are some great ideas for storing veggies without plastic on pinterest – check out some of my favorite boards for tips here for how to keep you goods crisp and fresh, without using plastic. This feels a little luxurious, but is still so super affordable! If you have kiddos and you like to go out to eat once and a while, it’s fun to whip out your reusable straw and let them feel a little extra fancy with their beverage. They are also great for enjoying a smoothie on the go. My tip on using a reusable straw and straws in general – you often have to act super fast to avoid getting a plastic straw at a restaurant, cafe, or bar. You might think about setting yours out on the table as soon as you sit down as a visual reminder to yourself and the waitstaff that you don’t need a plastic straw. Always let them know directly too – politely, of course. And be kind if they forget – it happens. One of these days, I think restaurants will start coming around on this issue and will cut down on their own straws, at least plastic straws. But for now, if we can do our part and let them know our values, the earth and all its creatures will benefit. You can find these in glass here and stainless steel here. This is a great way to cut down on disposable napkins in your life! I carry one of these in my purse all the time. Bonus – it doubles as a hankie in a pinch. Just remember to wash it (remove all ickies after use). I have a few of these so I can toss one in the wash after we use it, and then grab another clean one from our kitchen drawer. My tip on napkins – at some restaurants and cafes, let the staff know that you don’t need any napkins, because they may try to give you some with your food. And chances are they aren’t expecting you to have a napkin in your pocket or purse. But – surprise – now you do! You can see the ones I make with organic cotton here. But you can also just cut up an old shirt – knit cotton won’t fray too much (e.g., t-shirt fabric) – and keep that handy if you want to do the super easy DIY route! My handstamped napkins and tea towels. On display at the farmers market. I keep some of these in my purse at all times! There’s nothing worse than bringing home yet another set of plastic utensils that we don’t need because we forgot to bring our own. I’ve even shared with friends in the past – I keep extras in my purse for my kiddos, but I’m happy to let anyone use them! And I wash them after each use. I love small camping sized utensils for my purse, since my current purse is more of an oversized wristlet, and space is limited. I got mine at the local camping store, but you could also find some online or at a health food store. Or, super cheap way to do it – get some used utensils at the thrift store! The Goodwill in my town sells used utensils for about 50 cents each. Deal! If you dig around enough, you may even luck out on some small ones, or even a spork! Sporks are awesome, FYI – spoon + fork = spork! And don’t forget to let the restaurant/cafe know that you have them! Sometimes they won’t want to reuse a plastic utensil that has just barely touched your plate. I know, it seems wasteful, but they are bound by different health codes. So let them know before they are done putting together your food to avoid this altogether. A super easy alternative to a ziplock or plastic baggie is a cotton snack bag. At my house, we use these for EVERYTHING: sandwiches, crackers, plaintain chips, popcorn, granola, chocolate chips (don’t judge! ), pretzels, and more. I also use these to keep a hardboiled egg from getting too crushed in my lunch bag, and I’ll put a little tea strainer with tea leaves in there for making tea when I’m out and about. I’ll even put half an apple in there in a pinch – doesn’t keep it as fresh as a beeswax wrap (see below for more on that!) but it’ll keep the apple from picking up too much random stuff and also from getting everything it touches just a little bit damp and sticky. Tips for you on these little guys: We have about 10 of these in a couple sizes at my house, and often we use one over and over again a few times before we wash it. I’ll turn it inside out, shake out any crumbs, and let it air out a little overnight, and then put it in my bag again. 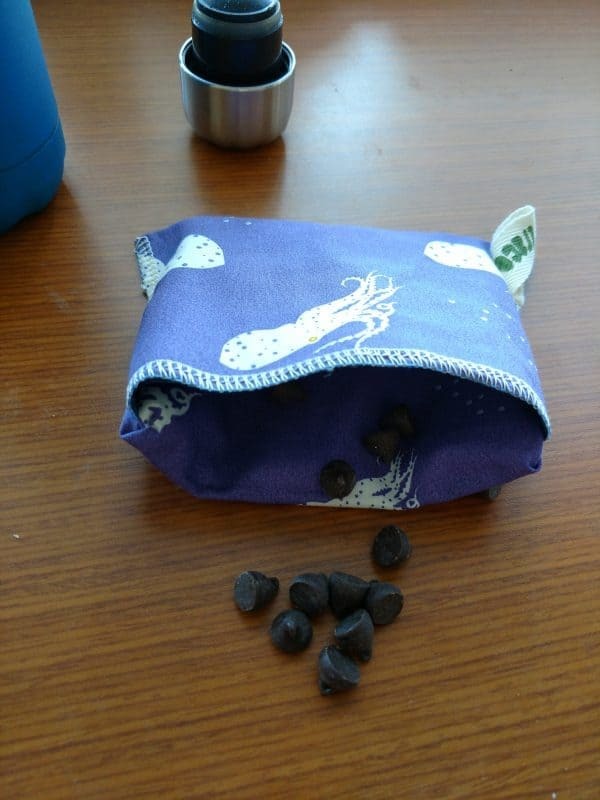 With things that don’t leave any crumbs (ahem, chocolate chips), I’ll just leave it in my lunch bag for the week or even longer and keep refilling it. Reusable Snack Bag! With chocolate chips! You can see a range of fabrics in my Etsy shop here. 8. Good old water bottle. This is probably the easiest. And you can also probably find some at your thrift store! I like stainless steel or glass for mine – minimizes any potential leaching of toxins from plastic or questionable metals. And I LOVE my Swell which I bought from one of my favorite local stores – Jones and Bones in Capitola. It’s great to get a good product and also shop local at the same time, if you are on the market for a certain brand. 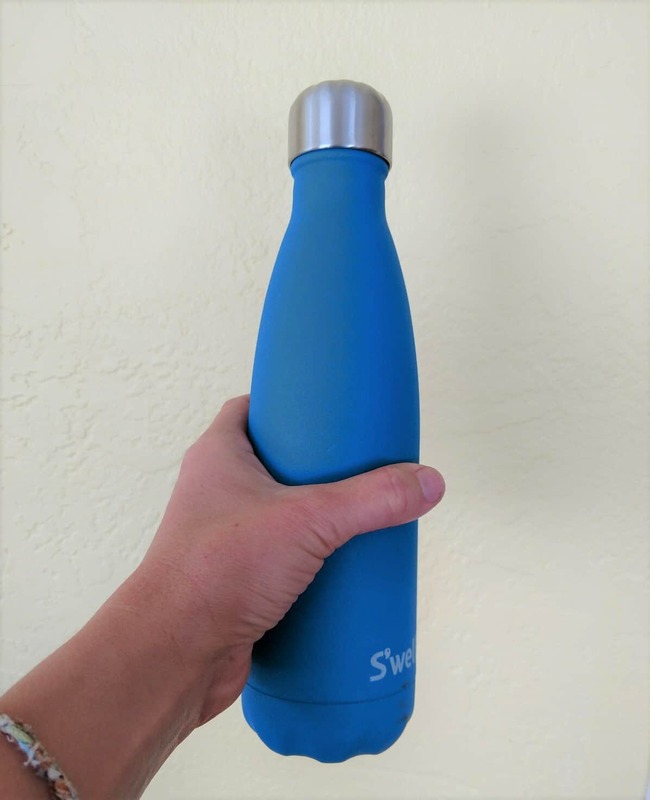 Swell water bottle. Love it! Beeswax wraps are a great alternative to plastic wrap, tin foil, and wax paper. Super eco-friendly. You can use them to wrap up your bowls, plates, or a sandwich or burrito. I also use them to wrap up half an apple or cucumber or avocado. They are super versatile, reusable, and fully biodegradable. You can read all about them in one of my blog posts here and you can buy them here. Okay, that’s another shameless plug for my loving handmade pieces. I can’t help myself! But if you aren’t into beeswax, there are also vegan ones out there! My favorites are made by a woman in Australia and can be found here. See, it’s not all about me! And you can also find some great tutorials online if you want to DIY it! Tip on DIY, though: unless you plan to make a whole bunch and maybe give some away as gifts, it may not be worth the time, money, and effort to make these. They are a little messy and some of the ingredients can be pricey and hard to find – and may only be available in packaging, which kind-of defeats the point! BUT don’t let that deter you! I actually enjoy making them, and you might too! My last eco-product plug: say goodbye to paper towels with dish towels! If you can integrate a dish towel or tea towel into your kitchen, you can eliminate SO MUCH paper waste! This also eliminates the water and energy required to make the paper products. We keep ours on the handle of our oven door, but there are lots of cute clips out there to hang it from a cupboard drawer as well. We use it until it’s grubby and needs to be washed. When we just dry clean dishes with it, it might stay clean for well over a week. I make mine in upcycled cotton whenever possible for maximum eco-friendly-ness. I also use organic cotton. You can check out my offerings here. You can probably find some at the thrift store too, if you’re not too particular about what’s on it :). Tip: If you use paper towels for cleaning up spills, let me suggest using rags instead! Turn those old clothes, too old to give away, into rags by cutting them up. We keep a stack in our closet and grab them anytime there’s a spill in the house. Cotton knits are less likely to fray. Okay, there you have it. My top 10 eco-friendly products towards a greener, zero waste life. Did I leave out your favorite? Let me know in the comments below! I’d love to hear your thoughts.